After 126 years Sears is bankrupt, failed, and out of business. El busto. They used to sell 'catalog home kits' back in the 20's-30's they ship it, you assemble it. 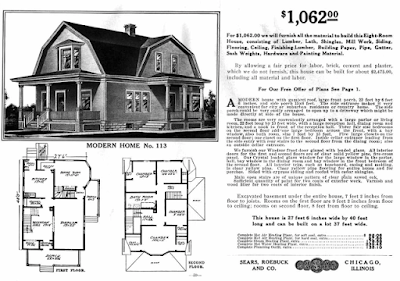 Can you imagine the materials to DIY build a house for $1000+ today? Not since the FED was attached leech-like to America's financial jugular. - While the concept may seem unbelievable in today's context, I actually live minutes away from a small community that has over a dozen models of these Sears homes that are still occupied and very habitable. They are sturdier, and architecturally more appealing, than any of their neighboring houses are. They are also on the National Historic Register. So long, and vaya con Dios Sears. Thanks for everything. - Amazon will never contribute anything remotely close in the years to come.